¡Mañana, mañana! 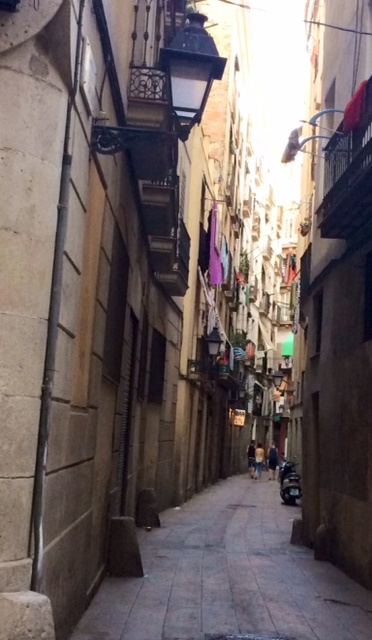 I’m in Barcelona! 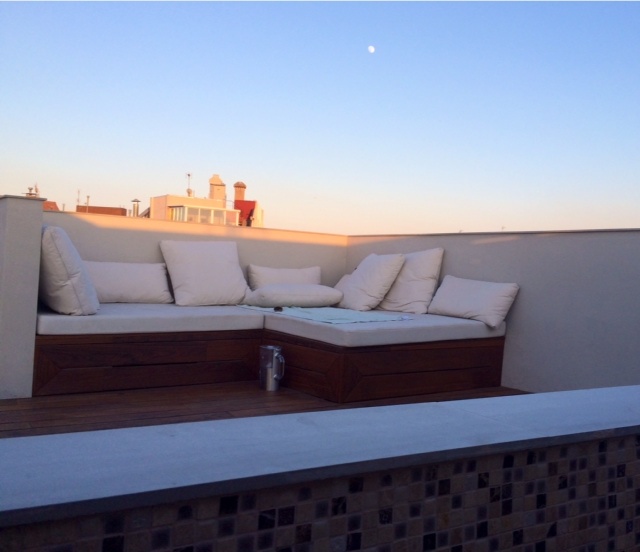 I love my rooftop apartment where I can literally sleep outside (on what I call my yoga deck) with a bed and outside bathtub. I’m under the stars. I love that feeling! 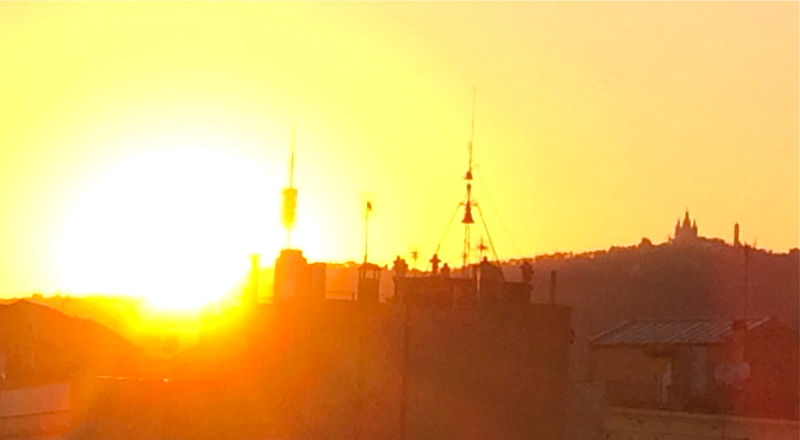 As I write, I can hear my neighbors having dinner at 10 p.m. on their roofs. Soft music, laughter and the clinking of dishes are the soundtrack to a gorgeous sunset each night. It’s so relaxing. So peaceful for a city. No yelling or honking of horns like you find in New York or London. A band played tonight in the square. I could hear seniors cheer and clap to the music that wove spanish guitar and accordion, sounding like a Spanish polka. As I write, I can hear bells toll, a child bouncing a ball and sea gulls squawk in the darkness. My apartment is about a 20 minute walk to the sea shore. Earlier, I took a bath under a nearly full moon. My little yoga deck is practically hidden from neighbors with roof decks across from me—the bathtub area is in a private corner anyway! This trip is about testing my boundaries and tackling fear. I travelled quite a bit when I lived in London, but this is a solo trip as my boys vacation with their dad in France. I wanted to go somewhere cheap to fly from London, since I meet back up in London to fly back to California with my youngest. I booked this flat specifically because it was on top of a building, mostly outside, (I have about 400 feet inside!) in a residential neighborhood. I knew it was up 8 floors, so I packed only a carry-on and my yoga mat! No hair dryer. Only one pair of shoes! Very few clothes since I wanted a few books. I had to think about just what I need for almost 3 weeks away. I simplified. And this flat outside where I write, read, eat and do yoga, forces me to engage (important when traveling solo) and detach at the same time. I find myself staring at the clouds and seagulls as they pass by. I watch old neighbors tend to amazing rooftop gardens. 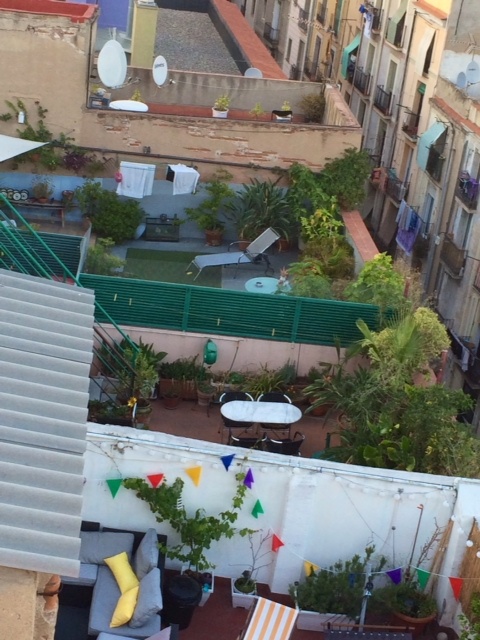 I can see younger neighbors doing laundry and cooking or playing with children on their own rooftop oasis. My neighbor’s large decks are amazing. On my little deck, I write. Often. I do daily yoga in insane heat, but with continuous breezes that feel like God’s breath. After bathing, I’ll walk very slowly into town to go to markets. I love wearing loose dresses—it’s too hot for anything else. I love smiling at people who smile back. My neighborhood is filled with bohemian artists with nose rings, dark makeup, tattoos—and also seniors who come out only at dusk to watch people from their balconies, while wearing smock dresses and old fashioned white linen shirts. The old and the new converge on this block, perhaps within this entire eclectic city. I am not in the main tourist area, and I am thankful for that. Yesterday I ate out alone. I normally hate doing that. I sat outside (it doesn’t get dark until after 10 p.m.) at a cafe table and just watched children run past, adults walking dogs, seniors playing cards. It was relaxing. An old man smiled at me, often. An old lady came over and asked me something in Spanish. I’m convinced she thought the blond girl playing with the water pump in the courtyard was mine. People are people wherever you go. Every southern city I have ever visited has been laid back. No rushing. Long conversations. No one was staring at their mobiles, except for the tourists, who were glued to them. I felt ashamed for that. I felt this way in Seville and in Tuscany too. Perhaps I am destined to return to a hot, slow-paced city again. Southern California, for all its sun, still leaves me cold by the icy Pacific breezes. Laugh all you will, but I had purple fingers after an evening beach stroll last week in Hermosa Beach! Plus, everyone is so busy. So very very busy in LA. I feel like I will move to a southern European spot someday. I know I could definitely live here. 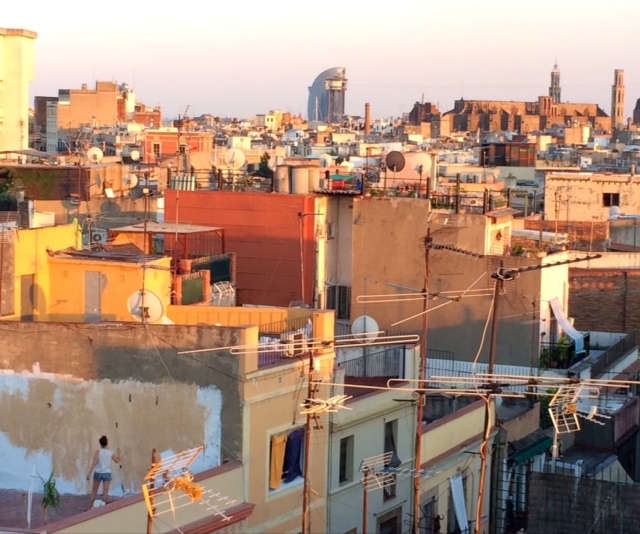 On my first evening in Barcelona, I sat on my balcony observing how the neighborhood begins to percolate once the heat subsides. I noticed a neighbor drag out a large paint brush and bucket. She began to paint her outside patio wall beige. 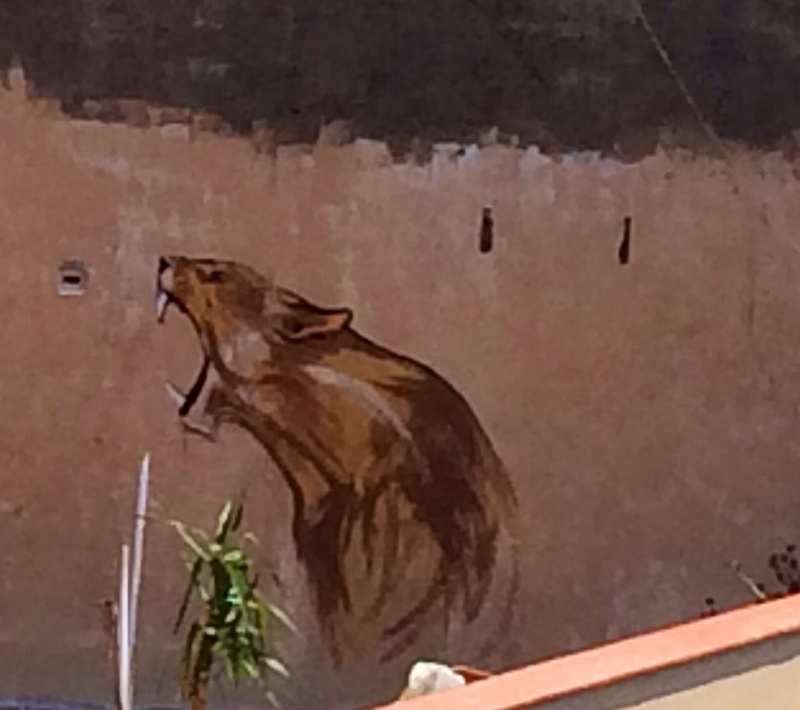 I naively thought she wanted a new color for her wall…I woke in the morning to find a screaming lioness mural across from me! How appropriate for my arrival, as I feel like I’m coming back to life after a long hard winter! irregularly. Spaces fill with a kind of soothing electric vibration. 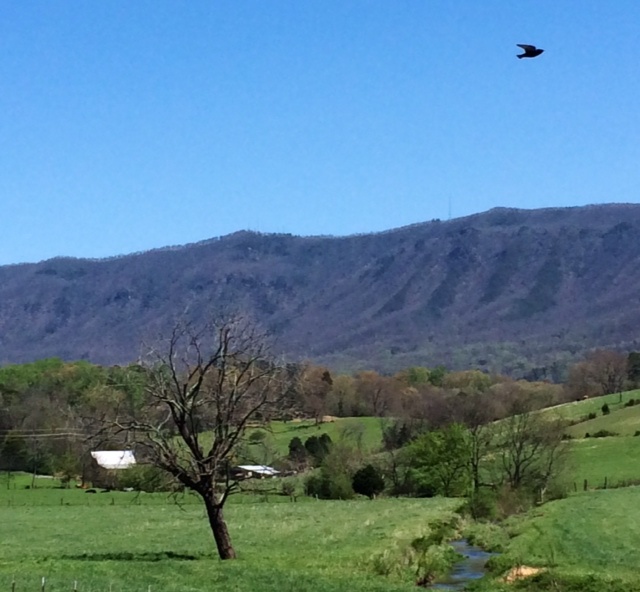 I recently went on an excursion in the appalachian mountains in TN & NC. 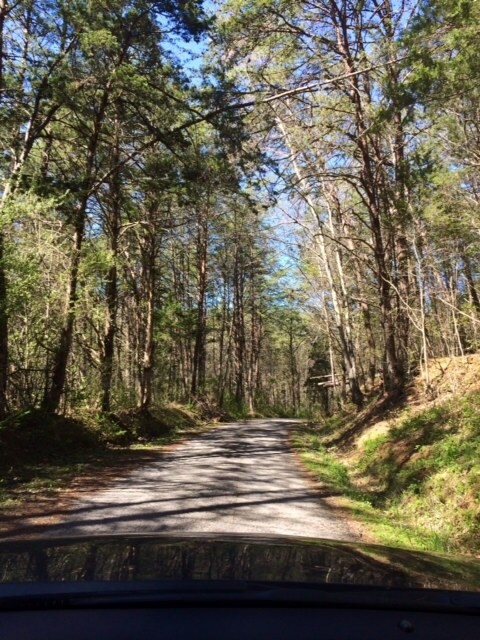 I love getting lost on old dirt roads where history seems to drip from the branches of trees. Getting lost here gives you a perspective that can rarely be found in today’s America filled with strip malls and manicured neighborhoods. 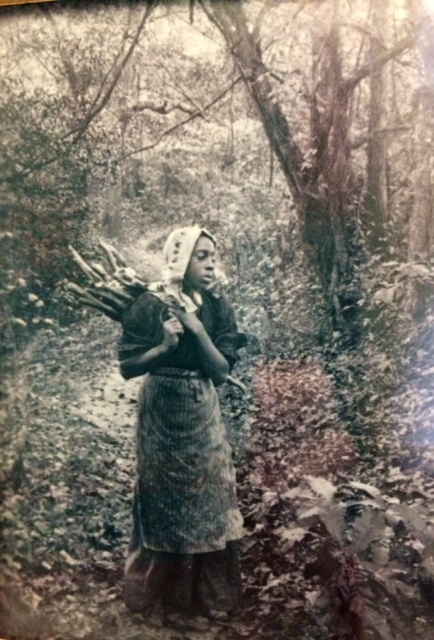 I sought to find images of a history that wasn’t always recorded. A past that can be sensed and felt from the old dirt roads, abandoned farms and barns, stoic river banks. The backdrop for part of my novel Uriel’s Mask is from this region, and from the pain of those who existed a long time ago, but were never recognized, named, seen, heard. They may never be, but their past still subtly influences the story of our present—which is especially felt in this timeless region of the country. How old is this house, now eaten by kudzu? What stories does it have? Only the trees and soil know, and they aren’t telling! 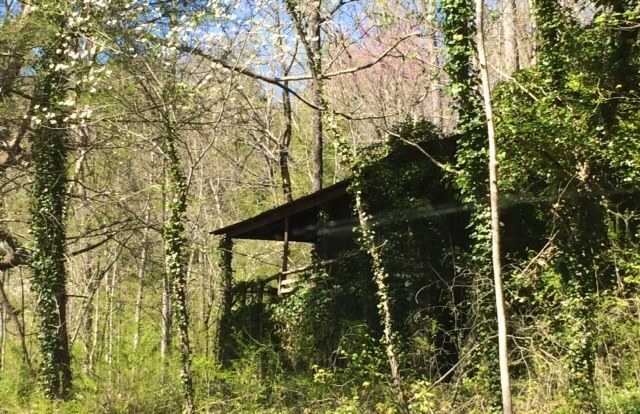 I found this cabin on an old dirt road near Townsend, TN…I was lost, but so glad I found this, as well as a few wild turkeys and one small black bear! 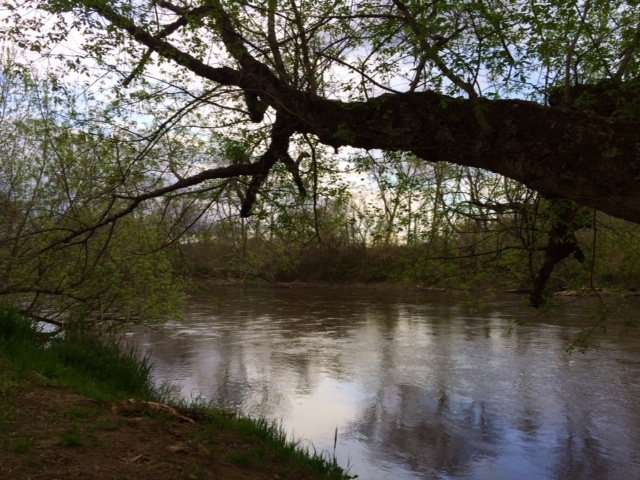 This stretch of the French Broad River in Asheville, NC seems to ache in a haunting way. Neglected from its former state of importance, few visit, and yet it rolls on as if a witness to those who died silently, nameless, near its banks. 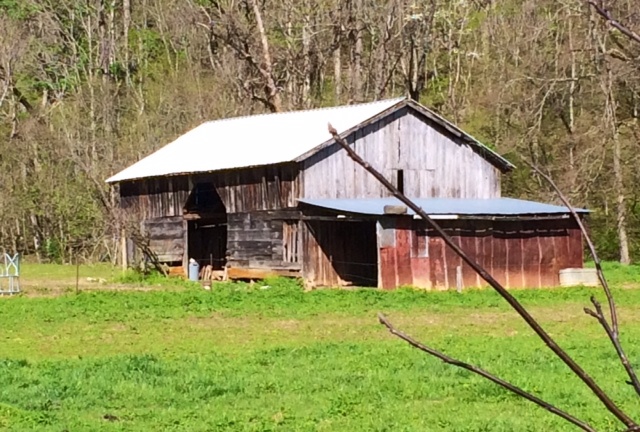 If you look closely, you can see the U.S. Mail sign sliding into a Blacksmith sign of this TN barn near Townsend on a winding old dirt road. How I miss horses! Gentle, powerful, sensitive, soulful—better company than most people. It was hard to see so many neglected in the mountains. Not brushed, left alone for months. These were better cared for than others I saw. 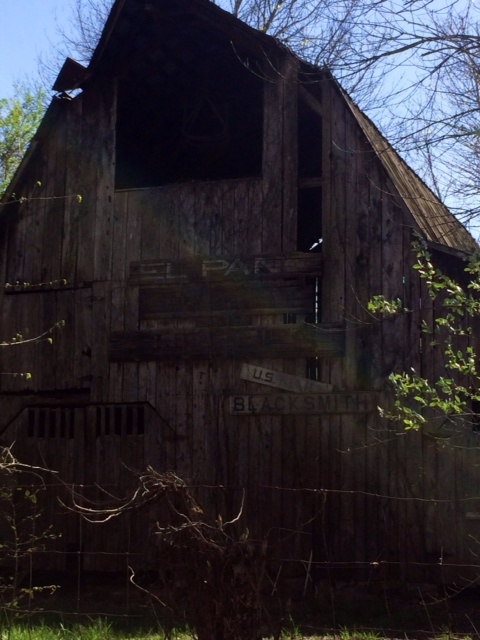 Why do I love old barns so? A typical scene between Nashville and Knoxville, TN. 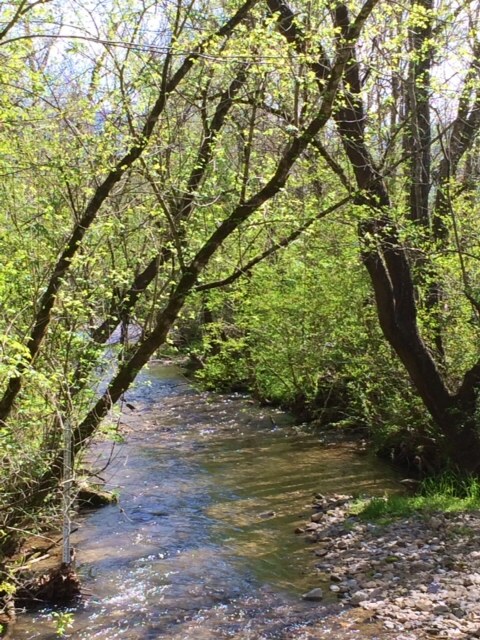 I will always love how trees arch and lean in across streams, as if yearning to touch, to comfort one another. They are silent witnesses to all who have walked near or sat on their banks. 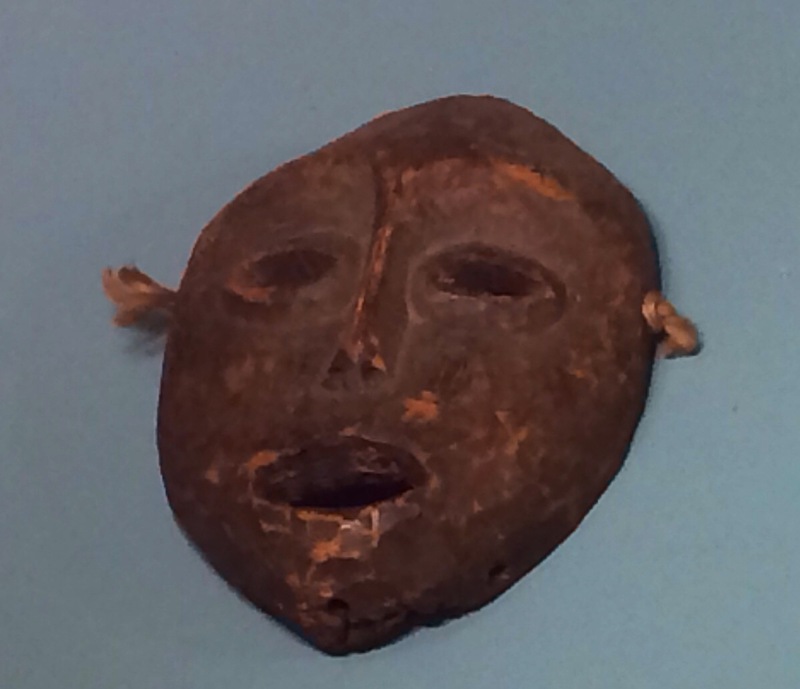 A mask found in Asheville, no name for artist, unsure of age. 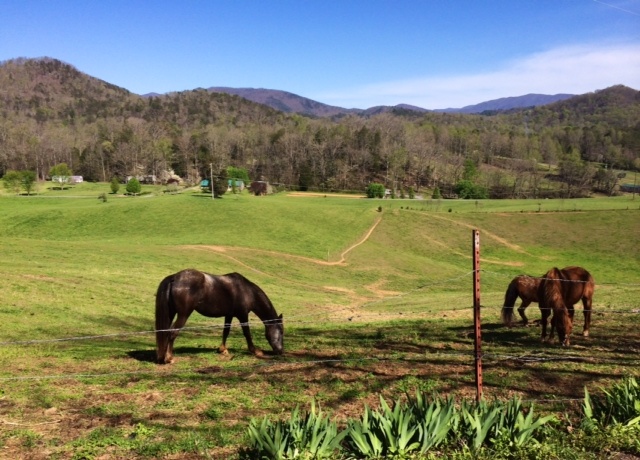 My time in southeast appalachia is always special. This time I researched details for my completed novel Uriel’s Mask. I am so grateful to the librarians, historians and art preservationists who bent over backwards to help me! And also to my sister Elizabeth who got lost with me, giggling the whole time. Sometimes it takes getting lost to get on the right path to be found, right? 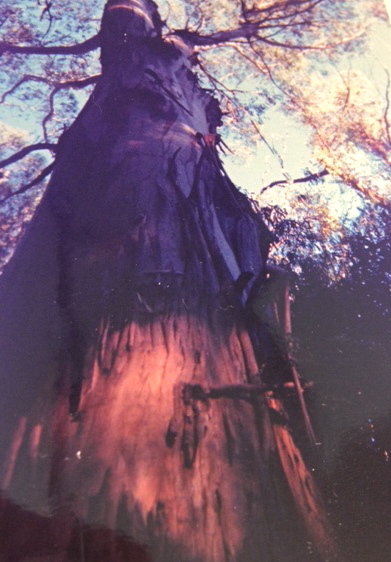 And thanks also to Georgene who looked after the boys so I could go on this adventure… Here’s a poem that has always resonated with me, as it strikes a chord of truth, especially for southerners who can sense how much of our painful history has slipped away without witness, into the soil, the river banks, the roots of trees—and even into the boards of old barns and cabins.